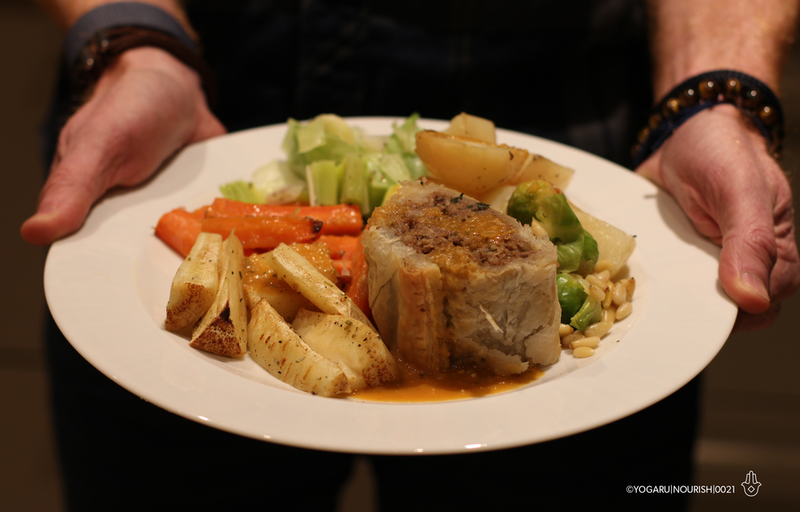 Last year we cooked up a plant based Christmas feast fit for a king – wholefood plant based or not. Vegan, vegetarien, pesciterian, flexitarian, paleo, keto… Christmas is a time of year for inclusion and one thing that we’re all in agreement on is plants are included! This year we continued our Plantie Christmas Feast new tradition. Christmas Day is spent with family which includes a traditional Christmas dinner. So me and my little plant chomping crew now have a plant based Christmas feast together at the start of December with vegan eggnog to start, tonnes of veg, dessert and cheesy crackers (not cheese and crackers!). Last year I made Beet Wellington. This year I wanted to mix it up a bit and I combined all I have learnt from making falafels, vegan sausages and veggie burgers, and came up with a new recipe which knocked the Christmas socks off my gang. This recipe makes three good sized rolls. We used one at our feast the second on our mock Stephens Day leftover day and will bring the third one on Christmas Day for those curious to try our way of eating. Below is the recipe for this years Wellington. For the Beet Wellington and all the veg recipes see my Merry Plantie Christmas Recipes article. Place your walnuts, pumpkin seeds, oats and chopped up bread into a processor, chop till broken down into nuggets and breadcrumbs. Put into a large mixing bowl. Saute the finely chopped onion and garlic and fry till lightly brown. Add the finely chopped mushrooms, all the spices and half a teaspoon of salt & pepper. Gently saute for about 10min or until some of the mushroom juice has sweated off. Place the saute veg mix into a processor and pulse. Leave some nice chunks. Add to the mixing bowl. Place your chickpeas, cannellini bean, fresh herbs, lemon juice, tamari & honey in a processor and blend. Again leave some texture. Add to the mixing bowl. Time to get your hands messy! Mush it all together with your hands, add more oats if the mixture is too wet. Add more salt & pepper at this stage if needed. It should be a malleable texture similar to a veggie burger mix. Shape into three big rolls. They can be wrapped in greaseproof paper and stored in the freezer at this stage if not using immediately. You can also shape them into burger discs or falafel rounds to store in the freezer. Preheat the oven to 200oC. Lay your pastry out and place your roll down the centre of the pastry. Brush along all edges of the pastry. Pull the sides up to and seal it along the centre of the roll and the ends. Glaze your whole Wellington and slash lightly along the sides. Bake for 30mins or until nicely browned. As soon as October kicks in I go mad making and baking everything pumpkin – starting with our family favourite pumpkin pie! Pumpkins used to be very hard to come by in Ireland. In fact, I was reminded today that we used to use turnips as our jack-o-lantern. Which lead to many a halloween injury I’m sure! Now we can easily get them in the most amazing shapes, sizes and colours. Call me a veggie hugger but it breaks my heart to see them in all their Halloween festive beauty decorating front doorsteps, not fulfilling their job in life to fill our bellies with goodness. Pumpkins help fight inflammation, keep you regular, are full of magnesium, vitamin C and lower the risk of heart disease and stroke. All that sitting on your front doorstep! Best way to prep a pumpkin is to cut the whole pumpkin up into chunks, removing the skin and seeds, pop it into a big baking tray, cover it with tin foil and bake it till its nice and soft. Then you can use it throughout the week in Buddha bowls, stews, falafel, soups and flapjacks. I also sometimes puree the baked pumpkin with a few dates and keep it in jars in the fridge to add to porridge or as a spread on toast. It actually tastes even better when stored overnight in the fridge, if you can resist eating it all in one sitting! Next time you find yourself in the veggie aisel pick up a pumpkin and free it from sitting sadly on a doorstep.